This webinar is presented through the Integrating Agriculture in National Adaptation Plans Programme (NAP-Ag), an initiative jointly led by UNDP and FAO, with funding from the German Federal Ministry for the Environment, Nature Conservation, Building and Nuclear Safety. Presentations and recordings now available. 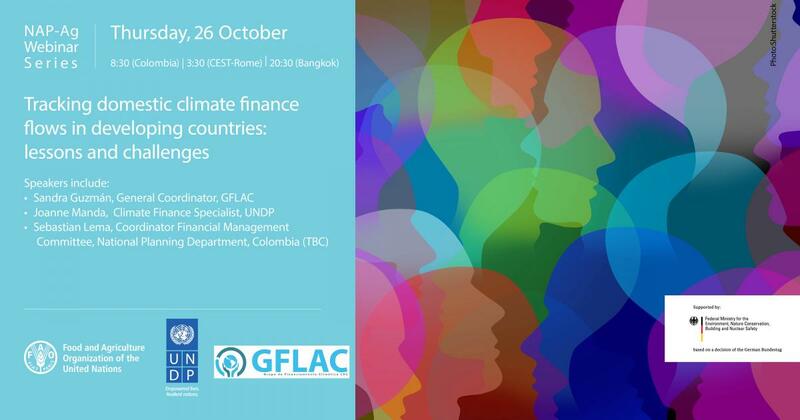 In this webinar, experts from the Latin American and Caribbean Climate Finance Group (GFLAC), UNDP and the National Planning Department of Colombia, shared insights and lessons learned from a study conducted by the joint UNDP-FAO NAP-Ag Programme (NAP-Ag) in partnership with GFLAC on tracking domestic climate finance. The study and webinar sessions focused on adaptation climate financial flows in six countries: Colombia, Guatemala, Kenya, Nepal, The Philippines and Zambia. Climate finance is a crucial element for the implementation of more effective climate actions and the goals outlined by the Paris Agreement and 2030 Agenda. In order to understand the financing gaps and the financial opportunities available to developing countries to fund climate resiliency efforts, it is important to understand the levels of funding available through global climate funds and domestic sources. In an effort to increase the transparency of climate finances, countries worldwide are starting to track both domestic and international finance flows. This is an important step to comply with the Paris Agreement’s Transparency Initiative. Present the results of the study conducted by the NAP-Ag Programme regarding domestic climate finance, particularly adaptation climate flows in six countries: Colombia, Guatemala, Kenya, Nepal, The Philippines and Zambia. Receive inputs from participants to further strengthen the results and support the work related to tracking climate finance at the national level.